Yellow skeleton left turn. Drawings: Oil pastel on paper and cardboard with red cardboard arrow. I’ve moved the drawings away from the wall and out into free space. This is the most 3-dimensional of my drawings so far. I plan to do a lot more of this; combining ideas I’ve had in the past, like cardboard arrows, with my object drawings. 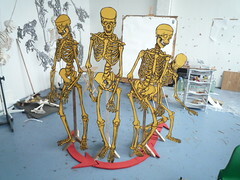 Here the skeleton is turned to it’s left, the action is illustrated by the red cardboard arrow.